One month ago I started advertising on MouseBux.com and it seems to be delivering a good amount of traffic for its size (and costs). Its Grid delivered 22553 visitors to my site which translates to ~750 daily visitors, and its price is not bad either: $9 per month (~$0.0004 per hit) and it gets even cheaper with larger duration packs. I see this becoming a regular in my sources. Apart from that they are running these regular promos called Happy Hours every now and then where they offer bonus funds on deposits through payment processors, thus keeping a nice intake flow of money for their site. A few days ago they started an upgrading promo where they offer free rented referrals for each upgrade until they deliver a 5000 in total RRs. I was to purchase long term advertising on their site so I was either way going to deposit ~$25 there and since there was a happy hour promo with +40% bonus there I decided to change my route a bit.. So, I went ahead and upgraded my account for 3 months golden for $25 there which got me 50 free rented refs and if I receive the bonus I will also have enough funds to also advertise on their grid there as well.. so it's like "hitting 2 birds with one shot" as they tend to say in my country for such cases.. It's ~24hours since I received the free referrals so checking out their activity I realize that they kind of crossed my expectations. To tell you the truth I was expecting to receive the typical bot behavior like "all of them clicking 1-2 ads a day EVERY day" but well.. to my surprise this didn't happen there. ...and of course 34 inactive ones so far but that's also understandable as a human behavior. They have this 3 month golden upgrade which is affordable as a testing period. 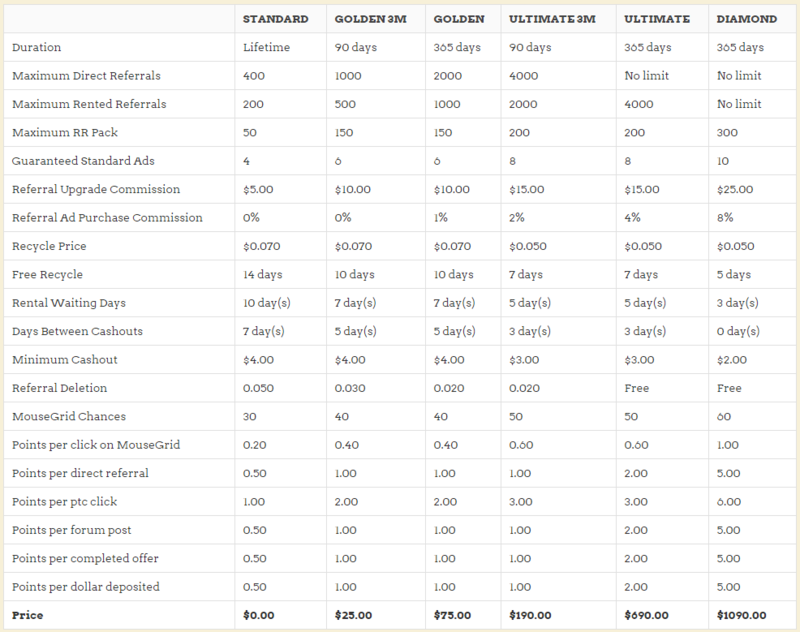 They pay referral upgrade commissions even to standard members ($10 per upgrade for golden). They pay some small referral ad purchases for larger memberships (but that's fairly understandable). 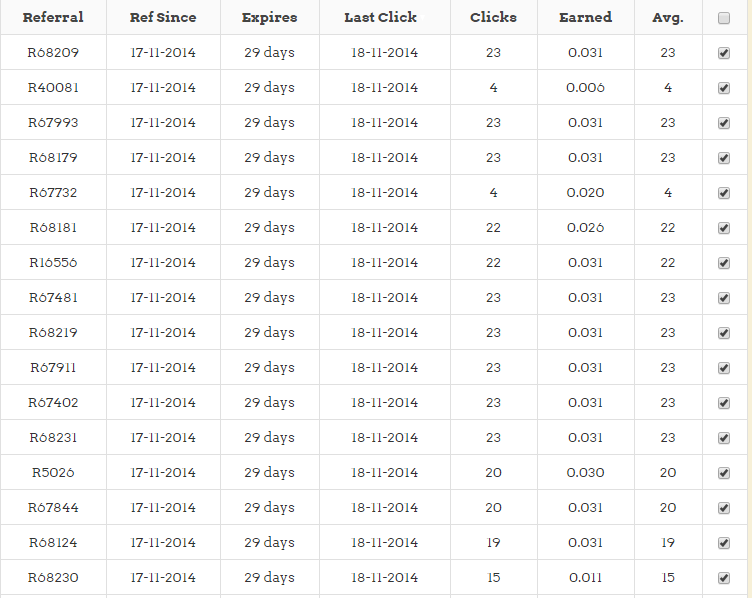 They pay for referral clicks of fixed ads purchased by members so the potential there is not limited to only 4 ads per day even if they are of lower value (you can see my RRs activity rates above). They do free recycling after 10 days for my upgrade but they charge a $0.03 fee for a referrals expiration (that's a con maybe). So, all in all, it convinced me to get in even if I'm gonna use my profits mainly for advertising. I added this to the downline builder in case anyone is interested in it even though it's still a "bux" site.. So that got me another $11 as a bonus to my deposit due to the 40% bonus of the happy hour promo. And I also purchased advertising there for a month. At the same time the 16 active rented referrals have accumulated $1 to my balance which means that they kinda earn me ~$0.50 per day.. with that in mind that's another $15 in a month so at that rate I'll at least get the value of my money back and keep the golden membership for another two months.. Things go according to plan so far. A bit of a con. The ads have that annoying forced view mechanic that is present in Twickerz and YGP. Besides the normal focused viewing, if something makes the focus shift from the page (like those pop-up confirmation windows) it resets the whole waiting time. Ouch.. Just yesterday I noticed Venkat had joined under me but I failed to update the downline builder on time..
Venkat could have done it himself. If I were you, I'd be glad that rui is in your downline. Of course I'm glad for Rui, it's just that I like to work on a team basis so, if joining like a chain benefits more people in my team then I would be prefer to do it that way.. a stronger team is better than a strong individual. Anyway, not much can be done now so let it be.. I just wanted to check the site. I'm not sure how long I will stay active on that site. So, I didn't want to deny your chance of getting an active referral. That's why I didn't update the thread. 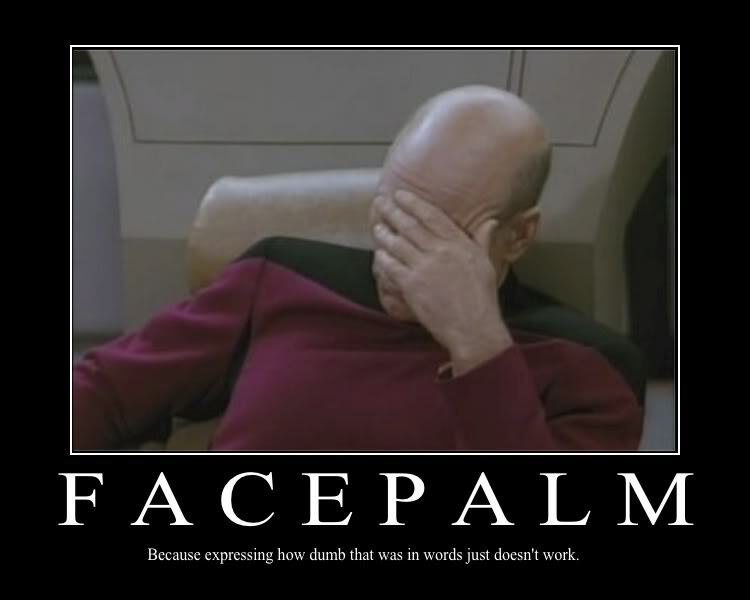 Although what some marketers do is that they'll update the thread and type "joining, brb..."
And they could then update the post either with their referral url or just type "cmo" (i.e. count me out). To be honest, I'm also trying out the site. I'm not sure if it's something I'll say very long term. Since I'm going on vacation soon, I won't try to get referrals just now, due the ol' "must click 4 ads policy"
So, it's all ok either way. Thanks! Though wouldn't it be fun if we somehow ended in a closed loop downline, kinda like constantbux? Haha, that was awesome wasn't it? Downline ended up rending the upline as a rented referral. We should have the ability to do that on demand in PTCs.. Since Mousebux sells referrals, it's possible to make a loop where downline and upline are both direct referrals of each other. One by referring and the other by buying.